Mixture of all sizes, multiple gemstone types (labeled for identification) mostly large and mediums..... Custom requests not included. No.. We do not sell drilled eggs....extra hygienic work, feeding into a pointless fear of them getting stuck when they cannot it's completely impossible. Only 1 place for them to go...DOWN....thanks to us having a closed cervix and thanks to that thing called gravity. Providing drilled eggs also feeds into a woman's notion to want to control things that do not need to be controlled. She must learn how to trust her body and use her body not learn how to pull on strings. QUESTION: Are they real gemstones? Do they come with a certification? We've been a gemstone dealer for over 7 years inside the mall. I (Felicia the owner) have direct access to about 7 mines globally and have gained personal connections at other mines around the globe. I have a partner who owns a gem cutting factory in Hong Kong. He's an importer and has the stones cut there into beads and yoni eggs. He does not provide "certificates" and neither does my shop. 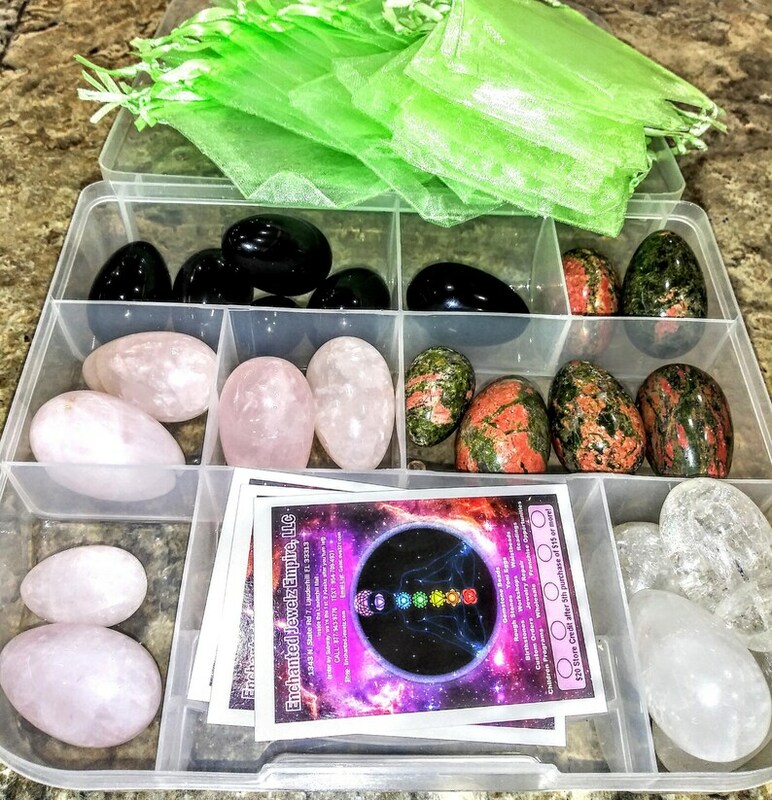 We are a community based metaphysical shop that teaches how to use and identify gemstones. There are plenty of artifical Moldavites sold in the market for example that come with a "certificate" but when one knows what to look for in a fake, they know. Certificates don't guarantee the stone nor the motives of the seller. A certificate can be designed & printed by anyone. QUESTION: How can I figure out of a stone is real? Well that depends on what it is. The best way of to get familiar with rough stones and to research how they are mined and how abundant they are. When dealing with widely abundant stones, such as tiger's eye or quartz for example, is far easier and cheaper to just dig them up than to create machines, create the molds and then creating the material and the design that will be used to duplicate the look of the stone. For any other questions, just contact us or text Felicia, the owner, at 954-709-4931 anytime!